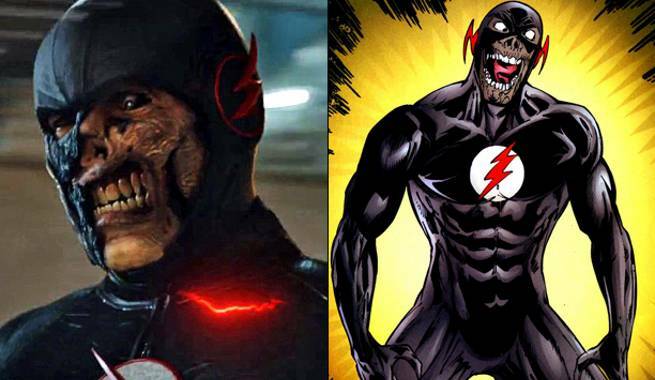 Arrow and Legends of Tomorrow’s executive producer Marc Guggenheim recently revealed some telling details about upcoming crossover elements in the Arrowverse, specifically the appearance of several characters on Legends, including Black Flash. It’s unclear which characters he’s talking about, but Robbie Amell’s Ronnie Raymond (the original other half of Firestorm) is slated for a return to The Flash later this season as is Rick Cosnett’s Eddie Thawne, so either one is a possibility, with the former being more likely for a program like Legends. Next week’s episode of Legends will also feature another appearance from Lily Stein, Professor Martin Stein’s “time aberration” of a daughter, a character that originally popped up in The Flash portion of the Invasion crossover event. Guggenheim also said that next week’s episode of Arrow has “the fastest crossover with Flash we’ve ever had,” so look forward to that as well. Legends of Tomorrow airs Tuesdays at 9.